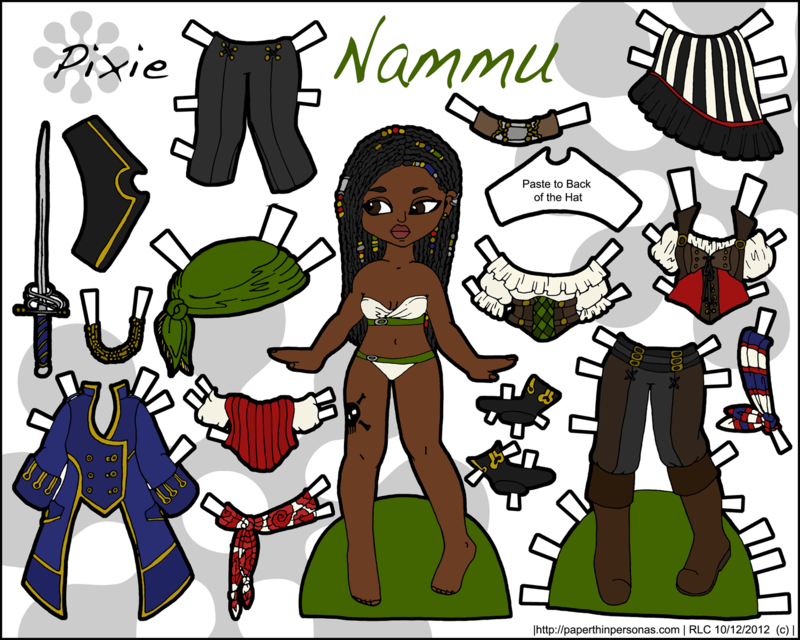 So, back when I drew this paper doll, I was like “I’ll get her up for Speak like a Pirate Day” and now I’m like… “Clearly, that didn’t happen.” I didn’t even have her inked until last week which is a pretty fast turn around for me. I have been playing around with the Pixies lately, so here is the first two page one. I think I will do this again, I enjoyed building a larger pirate wardrobe than I usually can on a Pixie page. Also, I finished inking a few Pucks yesterday and just got them scanned in, so people can expect some Pucks to be posted this month. I have been thinking it would be nice to do some Pucks aimed at boys just like the Dover Paper Action Figures, but I have no idea what little boys might want in a paper doll. Anyone with a son want to help me out on this one? Also, I get so giddy and excited when someone I don’t know at all links my site. NZ Ecochick posted pictures of her set of magnetic Marisole’s and it filled me with an unhealthy amount of glee. 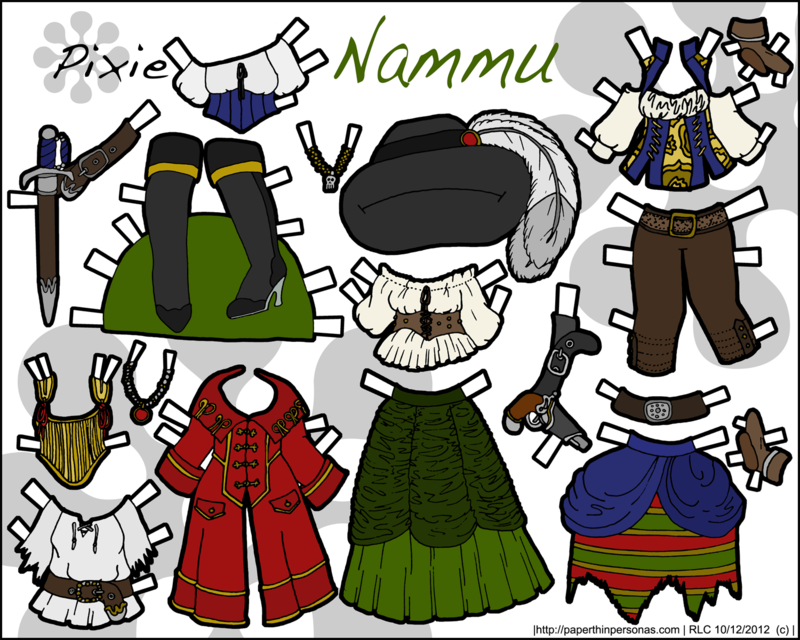 Paper dolls are so much fun to share and I love it when people do so. Relatedly, one of the search terms that came up for the blog last month was “purple paper doll” and I am going to be honest. I have NO IDEA what that even means… we live in a strange strange internet, my friends. I love her hair and tatoo! I dont have a son either, but my youngest likes a lot of “boys” toys. She plays with Ken over Barbie, even has a spiderman doll. I would say some type of a skater boy, with a skateboard, or for more whimsy, a super hero. Oh, and I noticed on my blog someone searching for purple paper dolls for Crohn’s Disease. That is the hope ribbin color for Crohn’s Disease. I wonder if your search for a ourple doll was related. Oh, I didn’t know that was the color for Crohn’s disease… that might explain it. Google Analytics just gives me a list of the various search terms, not the thinking behind them. Most of them make sense, but that one struck me as odd since there weren’t any other “color” paper dolls searched for. I feel good knowing the possible connection. I do have a Superhero in the works, but he needs to be scanned and inked. A project for tomorrow or next week. I do like the pirate idea and will have to take that one under consideration. Perhaps Nammu needs a rival. I know I’m a bit late to comment but I think my son would like playing with different job outfits. Fireman, construction guy, business man, policeman, bus driver. He’d probably also like playing with plain old regular clothes too. I’d be so stoked if you made some more Pucks! I just wanted to let you know that lots of your paper dolls (like this one) don’t work when you cut them out because of their hair. It’s too long so when you try and put the tabs over the shoulders the hair is blocking the way. I’ve found a way to fix it but it would be nice if you could improve that! I’m not trying to be rude so if it is then sorry! I always have assumed people would cut along the paper doll’s shoulders. I’ve posted some diagrams today.